Hi there fellow Mermaids! 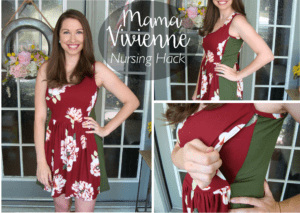 I am excited to share with you all a super simple hack to make the Mama Vivienne nursing friendly. 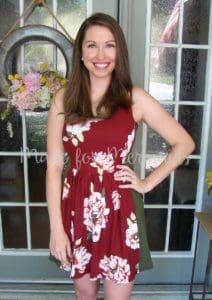 If you are a nursing mom then you are all too familiar with the struggle to find a dress that you can nurse in easily and comfortably. The Mama Vivienne is already incredibly flattering and includes numerous length options making it perfect for every occasion, not to mention pockets (everything is better with pockets!). With just a few quick adjustments the Mama Vivienne will surely be your go-to this summer! Fabric with great recovery! This is very important as you will be stretching the outer bodice frequently and will want it to bounce back in place each time. Enough fabric to cut a second front bodice piece, I recommend using the same fabric as your other bodice piece. That’s it! Now let’s get started. Step 1: Cut out all pattern pieces as instructed by the pattern and cut a second front bodice piece. I chose to use the same fabric since it peeks through a little on the sides. Now is a great time to make your cut outs for nursing! Hold your inner bodice piece up to your body and make a mark on each side where your cut outs should be. Keep in mind the tighter fit of the bodice so you don’t have your cut outs end up in an odd place ;). I found cutting a horizontal slit was perfect for my nursing purposes but use whatever shape would work best for you. (For modesty reasons, I waited to make my cut outs until after I finished and took these photos). *OPTIONAL: You can attach clear elastic around your slit for better recovery. Step 2: Cut two pieces of clear elastic the same length as the outer edge of your front bodice (from arm cycle to waist). 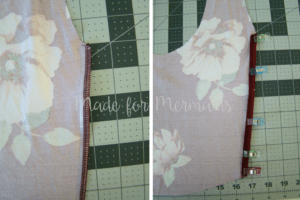 Then attach one of your pieces of elastic to the outer edge of the wrong side of the front bodice, using your preferred stretch stitch. Repeat on the other side. *NOTE: The bodice piece you are attaching the elastic to will be the outer bodice piece and the one you will see. So if you aren’t using the same fabric for both bodice pieces, make sure you attach the elastic to the piece you want seen. Step 3: Fold over the edge (that you just attached your elastic to) 1/2″ and sew down using your preferred stretch stitch. 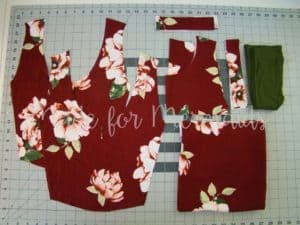 You will now lay this front bodice piece on top of your other front bodice piece, with both right sides facing up, and treat them as one piece. 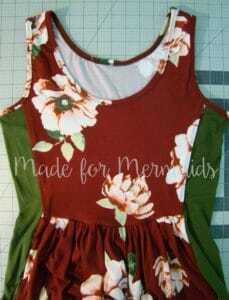 *OPTIONAL: Baste together these front bodice pieces along the bottom edge. 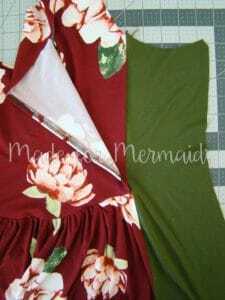 I skipped this step but it will help keep your front bodice pieces together when attaching the skirt. Follow the pattern instructions until it is time to attach the side panels. Step 4: When attaching the side panels to your front bodice, you will pull the outer bodice piece out of the way and attach the panel to the bottom piece only! Make sure you take the proper seam allowance so your side panel comes right to the very edge of your outer bodice piece. Once your side panels are attached, line up your bodice pieces once again and make sure they are completely flat before continuing on. 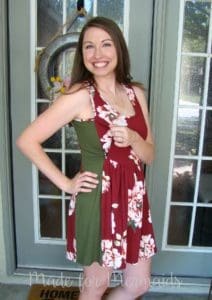 *OPTIONAL: Baste along neckline and arm cycle before attaching your binding. All that is left to do is attach your bindings and hem, according to the patterns instructions and enjoy your new Mama Vivienne! Megan K is a crafty, work at home momma of three, who drinks way too much coffee, loves running, and enjoys spending lots of quality time with her sewing machine. How did you decide to do the opening in the under-bodice piece? I am making one and I am looking at my different nursing tops and they all have different opening styles. I am curious as to what you used. I just cut a horizontal slit. Because the fabric is stretched for fit, it provides plenty of opening for me to nurse through. You’re right, there are endless options for the opening shape and size!